2 Top 3 Reasons Why You Need a Footrest? 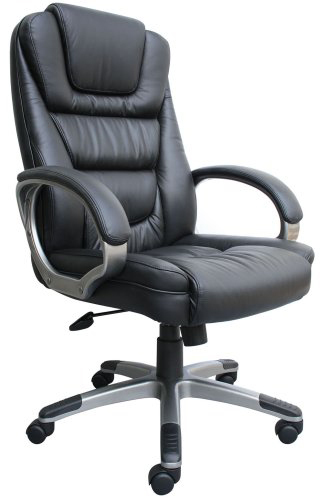 3 Why use a Recliner Office Chair than a Traditional Office Chair? 4 Why a Recliner Office Chair Improves Sitting Comfort? 4.1 Upright or Reclined – How to Maintain a Neutral Spine? 5 Why Would You Want a Reclining Office Chair with Footrest? Some people ask “What is a reclining office chair?” and our answer is simple. A recliner office chair allows the user to lie back in a comfortable position and still be able to complete his or her tasks such as operating a computer or work on paperwork. Recliner chairs also permit the user to stretch while sitting and keeps the individual from getting stiff when stationed in one position for prolonged periods. In addition to reclining, some best- selling office chairs come with a footrest so you can get the full effect of a complete recline. 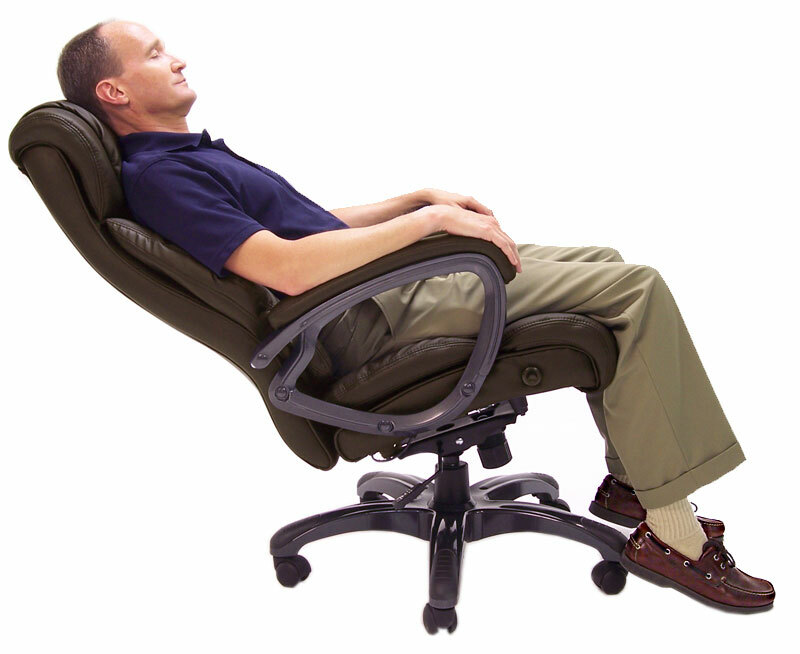 Reclining office chairs with footrest are great for taking a 5-minute relaxing break from your work or any reason you require that recline feature. Now, we want to show you some of our reviews of comfortable office chairs that recline. We pride ourselves in offering information on whether or not we think they are worth buying. Check for yourself, and perhaps we can help you with your decision. < img> It won’t be an overstatement to say that even if Elvis had left the building, he couldn’t help leaving without it. If this ultra-luxurious recliner & ottoman set was a reality back in his times, he would have taken it home. Sophistication is tufted in its pattern of buttons holding back the hi-quality foam to a comforting firmness. This piece of art from Homelegance adds exuberance behind every desk of power, be it a boardroom or the study. The leather upholstery with the Contemporary Aleron Collection is worth the slightly steeper price tag if you consider how long these beasts last. The knob adjusted reclining mechanism coupled with the ottoman helps you fully recline as the seat portion is simultaneously pushed by just pressing on a tension screw under the right leg. Despite its size and build complexities, this recliner can be easily assembled by anyone by placing the seat and the ottoman top on their respective bases with 8 screws each. < img> If an organization wanted to care for all their employees and not just the ones with corner offices, they would rather invest in these. By placing a recliner even inside multi-seating cubicles where the toughest are left to toil, you create loyalists. The optimal look and feel of this chair & ottoman combo is a combined effect of the black eco-friendly leather upholstered on lean frames of sturdy metal. It offers just the right balance of comfort and elegance for those who like it without the frills. And did I mention that all this was well under $100 you’d spend on grocery shopping? 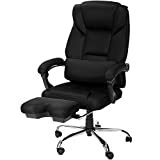 This recliner office chair is a good combo to buy if you want that extra level of comfort at the office without burning a big hole in your pocket at the cost of luxury. The quality of the PU leather might not be uber-stylish to the eyes or touch, but they are so to increase durability and easy maintenance. No rugs needed to save your hardwood floors. The leather-wrapped base ensures that it does not leave a mark where it is placed. If not a perfect match for the WWE Undertaker or any other giant, it would be sturdy and comfortable enough for every other full grown adult, who fits the average body type. < img> The integrated design and color combos of this stylish Executive Swivel reclining office chair with footrest, makes you feel as if it was released on earth after winning an intergalactic design championship. Citizen Futurists with a love for automation would feel at home in these. And when you’re cruising through your workday in these, stay assured with the lumbar pillow to watch your back. The bright colored accents available in 4 colors of red, blue, yellow or the more formal gray makes it even more appealing to a wider range of choices. The space saving design inspired by racing car seats is quite rare at this price-point. The only con perhaps lies in the retractable footrest which may bend over with usage while becoming difficult to retract. The Recline lock perfectly adjusts to the needs of both gamers and workaholics to grab a siesta in between their battles. Heavy Duty base & casters ensure that you come first even in those pointless chair races after office hours. 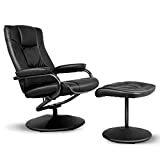 < img> When gamers are in another dimension and have lost the track of time, this is the reclining office chair with footrest to bring them back to their senses. It might not send precise electric impulses to the human consciousness, but it sure does tick off many points on the checklist to keep your posture right. Ergonomic design and adjustability are the core features of its design. Starting from the hi-density foam cushioning to the heavy-duty frame and finally, the soft-glide caster wheels, the makers of this functional piece of beauty have strived to give you something extra. 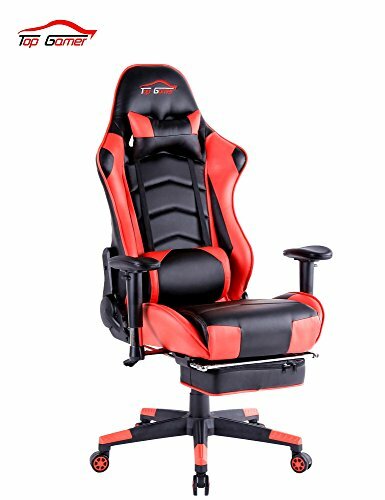 Reclining at 4 modes with a flip switch under the armrest helps you adjust your back for the right posture during gaming, reading, working or relaxing with your legs elevated for better blood circulation. Sturdy metal frame with 300lb weight capacity & lifetime warranty on the frame is something which sets it apart from its competitors at the same price. Adjustable armrest, neck rest & lumbar support cushion makes it highly customizable to accommodate a varied range of body types & heights. 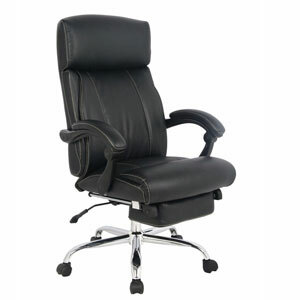 < img> There is a sturdy yet comfortable recliner office chair with footrest which could be easily moved around. Sounds oxymoronic right? Well, this is sweet spot hit by this full-recliner weighing only 40 pounds and more or less 40 inches in height & width. Being available in 4 colors to match the décor where it’s placed, this chair is equally functional at both home and office. The leather upholstery above the overstuffed padding is a big plus for the durability and comfort factor. The built-in pillow headrest might feel out of place at first. However, as you turn the knob to recline you feel the support sliding in just the right places. The non-adjustable low height factor might make it seem unsuitable for tall people. But considering the fact that you are fitting a recliner into tight spots, some people may consider only its compact dimensions. The overall build quality and sturdiness could have been better handled. But that again could compromise its affordability. Now, if you’re wondering why all the best-selling recliners are featuring a Footrest or coming with an Ottoman, this is where we start revealing the secrets. What follows, is precisely what you need to look through the sales pitch and choose what’s best for you and most importantly why it’s best for you. 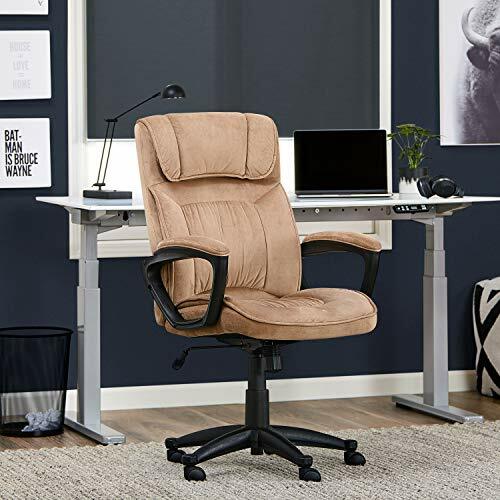 < img> If you’re looking for a high back chair that offers a comfy padded cushion for your head the Merax High Back Ergonomic Mesh Office Chair should fit that bill. It’s a rather attractive version of an office chair that would look really nice in a home office, or for anyone who enjoys the benefits of an ergonomic office chair and the comfort of a recliner and footrest. If your elbows tend to get sore from regular armrests, you’ll enjoy the extra padding on these, plus, the included footrest comes out from underneath the chair to turn an ordinary office chair into a comfy reclining chair. In addition, the adjustable back support can be fitted to your specifications. This recliner office chair can lean back quite a way, creating an almost horizontal lying position. The smooth glide casters are supported by a durable 5 point metal base that offers 360° swivel action so you can rotate where and when you need to be. If you want to relax during the day, utilize the tilt lock and tilt tension to control where you want the recline position to stay. Also, we just wanted to add that the price is amazing for what you get in this comfortable office chair. < img> Serta doesn’t just make mattresses; they also specialize in ergonomic office chairs as well. For example, this executive office chair is packed full of little surprises that are meant for your posture and your comfort. It also reclines when you want it to by pulling on an adjustment handle on the chair. You can also adjust the tension in which the chair reclines with the tension knob. Lumbar support is achieved with the special contoured design that cradles your lower back. Plus, your legs will fill revived with the waterfall edge that relieves pressure and strain on the back of the legs and helps promote circulation. In addition, there is extra padding on the armrests that is sculpted to create a nice resting place for your forearms, wrists, and hands. Furthermore, whether your desk or working area is located on the carpet, tile, or concrete, the durable, multi-surfaced wheel casters attached to the 5 point face will be able to move easily without snagging up. The recliner office chair is upholstered with a soft, durable, microfiber. Several padded pillows are incorporated in the design, including one located on the headrest. This chair isn’t just for working at your desk all day; it’s also created for relaxing. 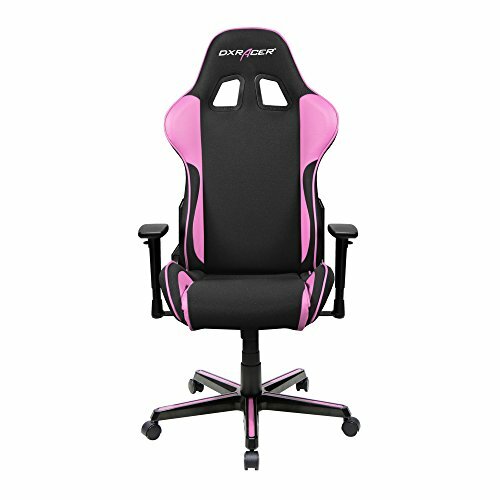 < img> If you’re looking for an office chair that not only supports your back and neck effectively, and offers a sporty, one-of-a-kind look, then you might want to consider the DX Racer OH/FE11/NO Racing Seat Office Chair Recliner Esport. 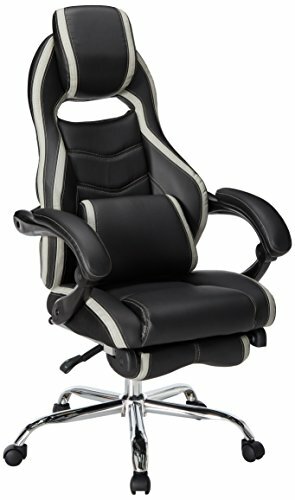 This office chair has been designed by using the specifications of an actual race car seat for comfort and support to the neck and spinal area. This includes incorporating a higher backrest to support the full length of the spine, an included head cushion, and fully adjustable armrests with soft pad cushions. It’s designed to adjust to various levels to accommodate your needs plus includes a tilt mechanism. In addition, you can purchase this unique chair in several different on black color combinations such as blue, green, yellow, red, orange, and the featured pink. This chair also features a heavy-duty aluminum base with the latest footrests. One of the nice inclusions with this specific office chair is the lifetime warranty on the frame and a 24-month warranty on parts. This particular office chair would be a nice selection for someone requiring that extra back and neck support with adjustability. 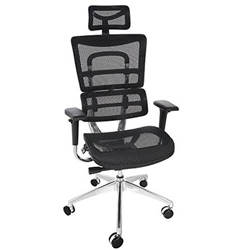 < img> The Basyx is a nicely padded office chair that can accommodate any size user. It features a swivel tilt mechanism with a tilt tension control. Height can be adjusted easily with the pneumatic seat height adjustment lever. In addition, the seat is contoured with double padding and the waterfall front design that supports the legs and assists in preventing fatigue. Both the seat and the back are upholstered with a breathable sandwich mesh material. The specific design of this office chair allows the user to control many adjustments for comfort. Productivity in the workplace is also improved when the individual is not constantly adjusting themselves due to pain or numbness from sitting that comes with office work. Furthermore, the design of this office chair is very lightweight at only 20 lbs. It does not have armrests, therefore, can be pushed up close and under a desk without restriction. A very strong frame and five-star base are molded from a durable resin. We would have to agree that this specific office chair is great for a person who is looking for functionality along with that needed comfort and ergo support. Talk about a nice reclining office chair with foot rest, the Viva Office Reclining Office Chair looks about as comfortable as they come. 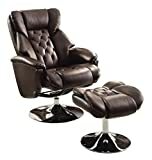 It’s constructed out of a leather material and includes a packed away footrest that makes an appearance when you need it. The great thing about this particular foot rest is it can be utilized without being reclined. 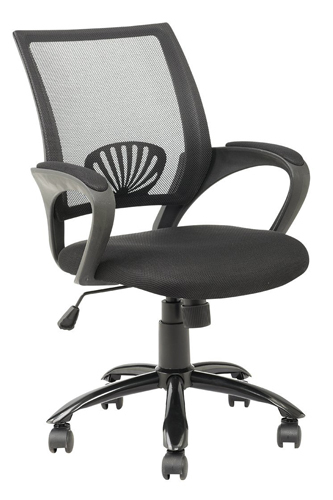 This is a high back office chair with several features that can be personalized to your specifications and comfort. These include a back angle control, padded head and arm rests, seat depth, and much more. Furthermore, it also is equipped with a swivel mechanism with heavy duty nylon casters and a chrome base for durability. The Viva Office Chair is capable of achieving an almost horizontal recline position so don’t be surprised if you find yourself taking a quick power nap during the afternoon. We believe that this would be a great bosses office chair or for the home executive. It’s rather handsome in its design and proves to be quite comfortable. It’s actually quite affordable with all the bells and whistles and at first sight, we would have thought it would have been rather expensive. 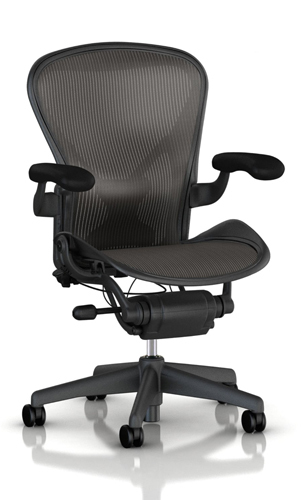 Another nice selection for an office chair with built-in recline function is the Ancheer Mount Ergonomic Computer Chair. 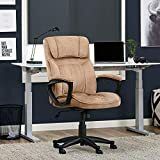 It permits you to lock the back of the desk chair in a reclined position or have a free tilt that will rock back and forth depending on your movements. This recliner chair is also equipped with 5 adjustable parts that include the headrest, backrest, armrest, seat, and height. In addition, you can adjust the angle of the tilt as well. 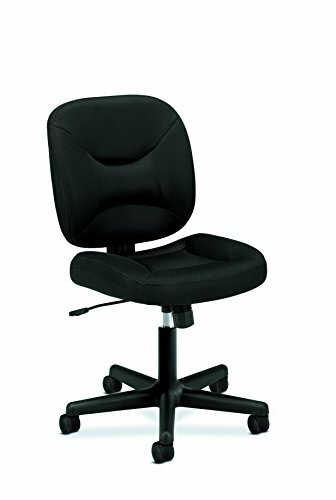 Additional features that are included in this unique office chair is the S shape of the seat back. It fits nicely in the natural curvature of your spine and provides further support and comfort for your back. This office chair is made out of a high-density polyester mesh material which allows you to feel cool and comfortable during long episodes of sitting. This office chair doesn’t just look nice and feel comfortable; it’s also considerably durable and can handle a weight limit of 665 lbs. It has also passed the BIMFA and the SGS tests to guarantee its quality. This recliner chair would make an ideal executive desk chair or an office chair for lower back pain to assist in relieving the strain and tension of a person suffering from back pain. Top 3 Reasons Why You Need a Footrest? – Footrests lift your feet off the floor while reducing the entire body’s pressure on them. To keep your feet comfortable and the blood circulation going well, it supports your feet just above the ground while also keeping it well ventilated. While reclining as the legs straighten, they support the upper & middle legs for a well-balanced posture. – Often when you’re sitting at a fixed height desk, your feet might not reach the ground to properly distribute the body’s pressure. The problem is even worse for people with below average or short heights. For such folks to optimize the advantages of an ergonomic chair, footrests come to the rescue by supporting their feet on a flat surface while equally distributing their weight. – You might have come across posters shouting that ‘Sitting is the new smoking’. Prolonged hours of sitting have proven to be causing blood clots and swelling in the varicose veins. While using a footrest ensures a slight movement of your legs in a rocking motion, which in turn keeps a healthy blood circulation flowing and reduces stress on your lower back. Why use a Recliner Office Chair than a Traditional Office Chair? – After the few initial hours of a typical workday, every employee starts to bend over into a stupor in the absence of a headrest. This causes muscle spasm to build up in the area and results in a headache or neck pain. – How often have you seen employees lifting their elbows above their heads to stretch both their hands? A majority of the folks from the last generation used to sit like that even at a party or movies. This is only because they were accustomed to sitting that way as their work chairs always lacked a cushioned armrest. – The backrest of most traditional chairs was either straight or curved & designed aesthetically to look good. Never was it designed keeping in mind the shape of the spine, which is neither straight nor oblique. So the lower back or the lumbar which takes the most body weight while sitting was never adequately supported. This caused excruciating back pains which some employees subdued with pain-killers. – In traditional chairs, there was no way in which you could adjust the height of your arms with the desk you were working upon. When the arms had to continually reach beyond the point of comfort, blood circulation was affected in the arms & wrist which created a lifestyle disease called ‘carpal tunnel syndrome’. – After long hours of sitting in traditional chairs, people tend to shuffle their seating positions with crossed legs or take a short break. But, in such a short time, they were not fully rejuvenated or comforted as the spine’s tension was not fully released without reclining. They have cushioned headrest or neck pillows which provide ample support for the long hours. They have adjustable armrests with hi-density foam and contoured design for ample support to distribute the upper body’s weight laterally as the arms rest. The backrests are contoured to support the human spine in a variety of postures. Even lumbar pillows and side cushioning relieves the tension in the lower back. They have a height adjustable mechanism to match the arms with the working surface and also let the feet rest comfortably. This creates the correct Ergonomic posture, which doesn’t cause back pain or improper blood circulation. Most importantly, recliners allow the person to fully relax his spine in a lying down posture and even take a short nap to feel completely rejuvenated. 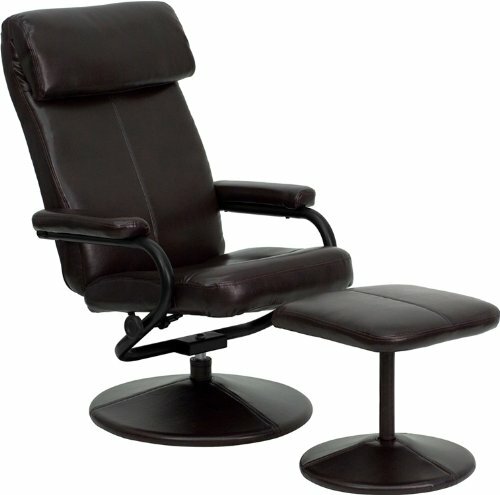 Why a Recliner Office Chair Improves Sitting Comfort? Does your office chair fight back while reclining? Or does it give in too easily as you lean back? In the worst cases, leaning back may have caused you to topple over. So, which is it? If you have faced any of the above-mentioned situations and wondered how to avoid it, you need to know how that big knurled knob under your office chair works. Instead of a knob, there might be crank handle which could be turned and there even might be automatic ‘Tilt Control’ if you are using a more sophisticated model. To tilt or not to tilt is a question, decided by this ‘Tilt Tensioner’ in every modern office chair nowadays. There is a spring inside this contraption and the knob or handle controls the tension on that spring. This mechanism allows the upper part of the chair to lean back with weight while maintaining just the right amount of back support. If you lean back very easily, you need to tighten this knob and if you have to push hard to lean, you need to loosen it. Leaning back while working is much needed because it de-stresses the spine by stretching it. The more optimal the leaning tension is, the more sitting comfort you have. Simple, isn’t it? Upright or Reclined – How to Maintain a Neutral Spine? Our bodies were designed to sit straight, stand tall, and keep moving. An upright posture with a straight pelvis and a stacked spine is how our elders taught us to sit & work attentively. But in 2006, some researchers suggested that a 135-degree angle between your thighs and torso is compulsory to maintain a painless back and a de-stressed spine. So, which advice would you follow at this point? What you were taught or the information which you just acquired? Is there no ideal posture in which you can sit comfortably for hours at a stretch? If you really want to solve this dilemma, you need to understand why those researchers advocated the 135-degree angle. They did it because they felt that such a position would help reduce stress on your lower back with lesser spine movements. But we all know how difficult it is to work in a slouching position. You’ll end up straining your eyes and hands to see and reach your work-desk, which moves further away as you lean back. More importantly, you cannot maintain the angle too as there is no tension spring in your back to stop you from slouching more. But there are more important things on your desk which would make you ogle at the screen in confusion or amazement or reach out to your keyboard. This would again make you lean in front, misaligning your spine and stressing all your lower back and neck muscles into a perpetual cycle of spasms and pains. Do you understand now, why you can’t keep those 135-degrees between your thighs and torso? Do you get why sitting upright with a stacked spine as your mother told still holds true? But as you are working in this age with so many things out of place, you have been blessed to lean back once in a while or take a nap in fully reclined position with the help of that magic contraption we spoke about earlier –the Tilt Tensioner. So now you know, that even if your job compels you to sit all day at your desk, standing up for a short stretch break or a few quick steps around the recess is the simplest way to reset the tension in your spine. And if you are slouching back or leaning forward, just maintain a balance between both. Keep a check on how far you are leaning back and how often you are bending your spine to stare at the screen. Why Would You Want a Reclining Office Chair with Footrest? There are several reasons that a person might choose a reclining office chair over the traditional style. Perhaps, its purpose is to also offer the choice of relaxing or taking a break after you’ve worked so hard or maybe you like to lean back and take a look at your completed job. Reclining chairs multi-task, they provide you more options for adjustments, and the reclining features help to stretch out your back muscles and promote better circulation, which in turn assists in keeping you more focused on your work. However, besides relaxing at your desk, these are mainly designed with ergonomic features in mind. They are suited to support the lumbar region of the back, allowing for better posture and additional movement. Plus, if you add a foot rest to the equation, you’re then reaping the full benefits of the reclining chair. Rejuvenated mind and body after intermittent relaxation tends to create better productivity. Keeps the body from becoming stagnant in a constant sitting position. More adjustments to design a chair that’s made for your height, shape and stature. In addition to all the features and benefits of these recliner chairs, they are generally considered an executive item. And because of that, the material they are constructed with is generally of a higher quality. They are viewed as a more attractive chair and are at this time, mainly purchased for a home office or an employer’s private office. However, if employers start to realize the importance of comfort and ergonomics in the office place, they will soon realize that it, in fact, helps them by keeping their employees comfortable and productive while taking care of their backs, legs, necks, and arms. Protect your investment. Furthermore, less back injuries mean less work comp claims as well. If you’re familiar with the office environment, you also know that office and computer jobs can be tedious with long hours spent sitting in one place. It’s not a physical job so your body is not getting the exercise and the natural movement it requires to function normally. It’s being trapped in an unnatural sitting position while the worker uses his/her mind and hands. It’s important that if you do find yourself in this type of predicament, you need to take time away and move your body at least 10 minutes every hour. 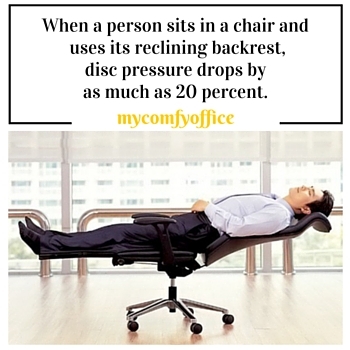 With a reclining office chair, you can do this by leaning back, taking the pressure off your spine and legs. If you plan on purchasing a comfortable office chair for yourself or your employees, it might be in your best interest to consider one of these ergonomic wonder chairs which are more health smart and also an attractive piece of furniture. Our mission is to provide you researched and valuable information on the products that you need. It’s understandable how confusing and intimidating it can be with all the choices available. The difference between us and the manufacturers or brand name companies is, we aren’t trying to sell or promote any item. In fact, we want to provide the pros and cons of everything and only list the products that have demonstrated themselves to be a nice product. 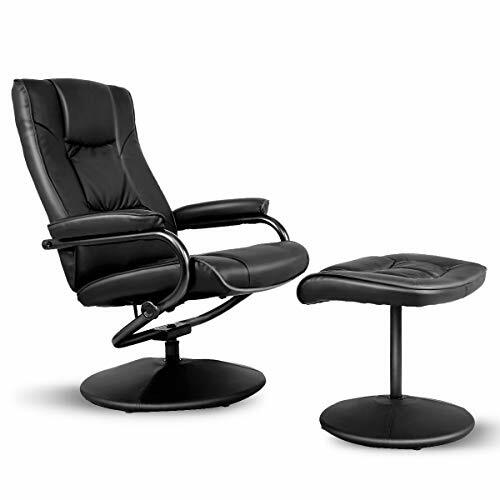 With reclining office chairs with footrest, there are many selections and types available. 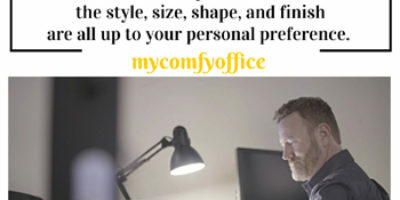 Some are nice as a computer chair, some work well with a home office, and some recliner chairs provide the support you need for your back, necks, legs, and arms. We hope this information on recliner office chairs and their benefits have been helpful.